If you have not yet discovered A History of Food in 100 Recipes by William Sitwell, I’ll just say it now to get it out of the way: “you’re welcome” for turning you on to it. This is a real gem of a book, from its heft and pleasing cover texture to the knowledge and tales within, and it belongs in the core of any cookbook or food writing collection. Let me back up. William Sitwell is a British food writer and editor (most prominently at Waitrose Food Illustrated). In 2010, he bought at auction a collection of 19th-century culinary books and ephemera. 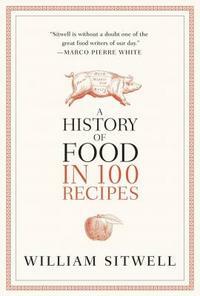 Starting there, he delved deeply into the history of food and cooking, much to our benefit today. How the fateful meeting of Spain’s Cortés and Aztec ruler Montezuma II helped develop and spread hot chocolate. How Frenchman Denis Papin created the first pressure cooker in 1681 only to be dismissed and die impoverished. How Escoffier reinvented teamwork in the kitchen; how he and his partner Ritz embezzled and were fired from the Savoy Hotel in London before teaming up for the first Ritz-Carlton Hotel; and how peach Melba was created and named for an Australian actress. How Ken Hom grew from poverty and knowing no English in Chicago’s Chinatown to a TV star in England who sold more than 1 million copies of Ken Hom’s Chinese Cookery in 1984, before rice wine vinegar and soy sauce were in grocery stores. While the earlier chapters are more interesting (to me) than the more contemporary stuff, A History of Food in 100 Recipes is riveting food fun. Spend the next 100 days reading one of these pieces at bedtime, and you can replace me as the know-it-all at the next dinner or cocktail party.